Move heavy goods – and animals! – around the city with the super-powerful LEGO® City Cargo Train! This awesome motorized train with 8-channel, 7-speed infrared remote control can transport almost anything. So it’s your job to make sure the cargo is in the right place at the right time to keep the city running smoothly. Attach the cattle wagon and 2 cargo wagons together and pull them around the circular rail track with the locomotive. Operate the forklift to move the pallets safely between the wagons and truck. Keep track of all the cargo leaving and arriving in the office at the impressive cargo train station. There you can use the sliding overhead crane with hook to move heavy cargo between vehicles or onto the ground. With so many play functions and cool features, this really is the ultimate set for train enthusiasts! Includes 4 minifigures: forklift driver, train driver, farmer and a truck driver. This comes down to 22.52 cent per brick. 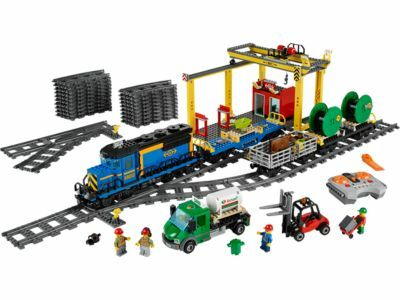 The Cargo Train (60052) Lego set is no longer directly available from the sites below. However, 3rd party partners of these sites might still have the set available. Alternate description Drive the motorized LEGO® City Cargo Train with 7-speed infrared remote control plus rail tracks, truck, forklift and cargo train station.